Well, we had an amazing Christmas at our house, and are still celebrating with my mom & dad in-law that are here visiting. It hasn't left much time for scrapbooking, but I do have a layout to share, made with "Times Square", the December scrapbooking kit from the Paper Bakery. I added the cute little chipboard camera from the kit, and layered on some of the other goodies too like the Jillibean Soup flashcard and the exclusive Paper Bakery flair button. I also added the sparkly sequin pocket. For the sequin pocket, I cut a strip of the plastic bag the kits come packaged in and sewed around 3 sides, leaving 1 side open for adding the sequins. 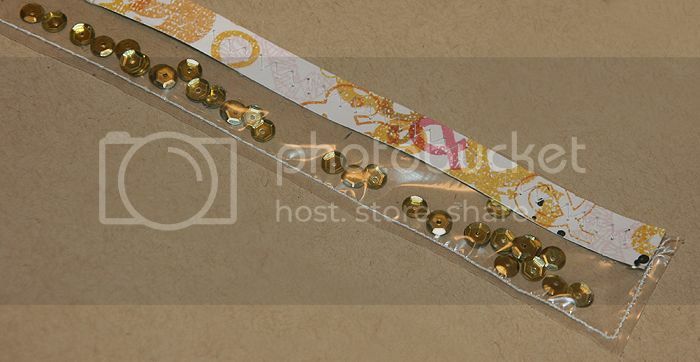 Next, I added the gold sequins and then stitched on a small strip of the patterned paper. To finish the sequin pocket, I glued it to my layout, a perfect way to add just a little bit of sparkle!!! Fantastic page, I love how you made a narrow sequin pocket and the colours are great. This is gorgeous! LOVING the colors, the little owl and those sequins!!!!! Suuuuuuper cute! Love the long sequin pocket girl! Very cute. I too love the sequin border pocket..very creative! I love that sequin pocket - so clever! Loooove this layout! The sequin bag is awesome! Love that you used the bag from the kit! Very pretty. Love the sequins! Fab layout Mary Ann!! Love how you incorporated the colors to match your girlie's outfit in the photos! And the sequin pocket is such a fun touch! Okay the sequin pocket is fabulous! !